GARDEN TO TABLE at Owairaka District School | Growing fresh vegetables and cooking delicious kai! Growing fresh vegetables and cooking delicious kai! Last Wednesday was a beautiful spring day, and seeing as the hall was being used for production, we decided to set up our tables outside! The meal of curry and roti was extra delicious too. I am so impressed with the way the kids can now independently set up the tables and serve out the food. May has rolled round again (it’s been one year since I started at Owairaka as the Garden Specialist) and we’ve just got our broad beans in the ground. Last year we planted one of our large beds (2m x 3m) with broad beans only to have quite a few of them topple over in the wind. Unfortunately our efforts to support these came too little too late. So this year, taking stock of the lessons from last, we decided to get in early and erect structures to support the broad beans from the outset. It’s amazing how floppy they get so early on. 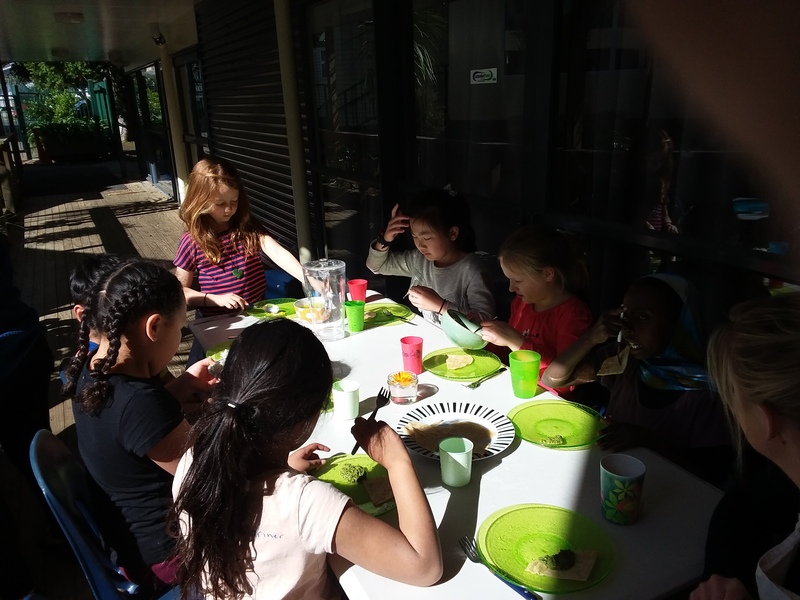 Two of the classes in Kauri Team had trays of the germinating broad beans in their classrooms and already the young plants, some at a lanky 15cm tall, were on a serious lean (most likely they were leaning to get to the sunlight!). Another trick is to pinch out the tips of the young seedlings when they get to 7-10cm in height to encourage the young plants to branch out and to produce their bean pods earlier on. So for support we’ve gone for a bamboo stake and string construction. We were also thinking about trying a teepee structure in one half of the bed but decided we’d get more plants in the bed if we stuck to straight rows. The plan is that as the plants grow taller we’ll be able to use the stakes to tie string to support the plants. We also left a space for boards down the middle of the bed between the double rows so that we can more easily access the plants in the middle of the bed. The kids enjoyed the challenge of hammering the bamboo stakes in and stringing these up. Here’s hoping for a better result this time round! Pardon the pun (strawberry runners – get it?)! So another seasonal job has been the replanting of the strawberries that have multiplied since last year, including some of their runners (baby plants). The raised box in front of Room 16 was full to overflowing with the strawberry plants. We needed to find another bed to transfer some of these to. * The recent removal of the kumara from one of the beds by the swimming pool has provided an ideal spot for a number of the strawberry plants. So it was today’s task to get these transferred. It took all three sessions to make this happen. Rm 24 did a final methodical digging over of the bed to check for any remaining kumara and an exercise to measure and calculate the total number of plants we’d be able to fit in there. Rm 24 dug in compost, horse and sheep manure and leaf mulch to give the soil the necessary goodies and to aerate the wet soil to support the hungry strawberry plants. Rm 22 formed the mounds to assist with drainage (strawberries don’t like getting wet feet) and carefully planted 25 plants along the 5 mounds. Now all we need to do is add a layer of pea straw mulch between the rows to raise the fruit away from the soil when these come. Job well done Kauri Team! * Strawberry plants can be planted later in the year in Spring, but it is always good to get a head start by planting these in Autumn. That way their roots can get established over the wet Winter months ready for the plants to produce in late Spring and Summer. A huge thank you to Bunnings Mt Roskill for the recent donation of new gloves for the school’s G2T programme. After many weeks of mismatched, grubby gloves, the kids were thrilled to receive the new ones. Now we just need to make sure they stay together and don’t go walking! While digging over one of the overgrown garden beds we came across some very hard subsurface obstructions. What had we struck? Perhaps some treasure? The mention of treasure had the gardeners from Room 23 in a fit of excitement. Never mind the gardening, they wanted to uncover whatever was under the soil! So they set about digging and scrapping. At one point I was a little concerned that perhaps we might have come across a manhole or casing for pipes from the swimming pool. Images of burst pipes momentarily ran through my mind! Last thing I wanted to be doing was causing damage to the school property, especially the school pool! Warily we continued to dig until David, one of our volunteers, reached the conclusion that these were not treasure but most likely leftover concrete footings for fence posts. We wondered why they would be in the middle of the school garden? Anyway, the kids from Room 23 were determined to get this first hunk of concrete out of the ground. It took a lot of heave ho-ing and hands on the job but in the end we managed to haul this great lump of concrete out of the bed. It was a real team effort. Even though it wasn’t a trove of buried treasure. the gardeners from Room 23 were proud of their efforts. This meant we still had one hunk of concrete in the ground that needed to be removed. The time in the garden was over for Room 23 and so it would be a task for the next class. I mentioned to the gardeners of Room 24 that we might have discovered treasure in one of the garden beds. Like the class before them, they were definitely more interested in digging up buried treasure than doing the gardening. It wasn’t long before they had the buried concrete uncovered and were levering it out. At one point I had gotten in there and tried to shift it but decided that it was much too heavy for one person to shift. A couple of the boys raced off to fetch Thomas (as you know our Thomas (the school’s caretaker) can do anything!). But meanwhile in stepped slight Jasper who single-handedly hauled the lump that no one else could move out of the bed!!! Those of us standing round were dumbfounded! After that he was on the look out for other jobs requiring his super strength! Ah the talents that come out in the garden! As the focus is Unity this year, making steamed pudding to share with the whole school as part of our Matariki celebration was a great way to show kotahitanga. It was a challenge for the kitchen groups to produce 40 steamed puddings, but by working together, and a few tips from the volunteers, they did it! The search has begun! Ever wondered what all those leaves are covering the beds by the back wall of the swimming pool? “Pumpkin!…?” said some of the kids from Kauri Team. No. The great mass of leaves is actually covering what we hope to be a great harvest of kumara! We started delving tentatively and carefully into the soil under the leaves. Tentatively because most of us have not harvested kumara before and carefully because kumara can be easily damaged. The kids learned how it is really important to take care while excavating out the kumara as chopping into these can result in the kumara being ruined. Using hands to excavate is best. The first class (Rm 23) found a few but rather small specimens of kumara. While it was fun I admit we were a little disappointed especially as the great pile of leaves showed such promise. However, the kids from Rm 24 were rewarded with the discovery of a few large specimens! Hopefully it’s a sign of more lurking! The kids are dreaming of kumara chips and other kumara delights! Join in! Volunteers needed every Wednesday. Click logo for more details. Receive Posts to your Inbox! Garden to Table Trust Tweets!